Send us a list of the titles you want and the edition: Regular edition (paper), Regular edition (cloth) or Special edition. We ship through the U.S. Postal Service via Media Mail. Postage for 1-4 Books is $6.50, for 5-8 Books is $8.50 Kentucky residents add 6% sales tax. If you would like us to ship via Priority Mail call us for that postage total. We do ship Broadsides via Priority Mail, again call for that total. 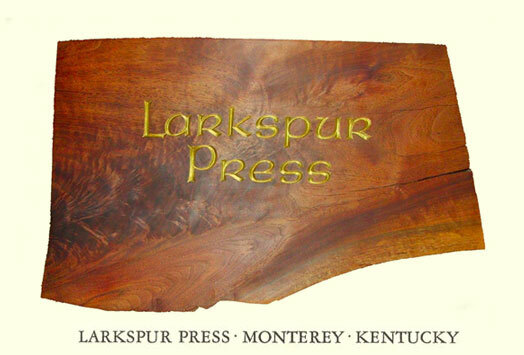 Payment should be made by check or money order payable to Larkspur Press. Sorry we do not take credit cards. You are welcome to call with questions.